Stocks Unleashed: Malaysian unit trusts: Good investment? I'm back guys. Sorry for the long absence. I just went to China for holidays. Thank God I went to Guangzhou during CNY season. The traffic was good since many had gone away to their respective "kampungs" for CNY. If not, I'd probably spent most of my time on the roads. Looking at the tables above, generally unit trusts underperformed their benchmark indices (unfortunately). There seems to be no additional benefits of investing in unit trust funds as compared to individual stocks or bonds. However, it seems that equity funds were more resilient during market downturns. This could be due to greater diversification of the funds though this would need further analysis. 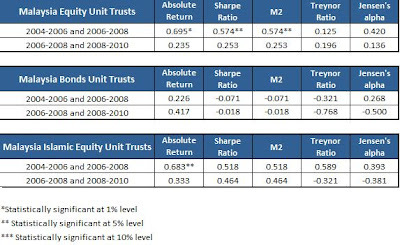 In addition, the Spearman rank measure seemed to show that there was little correlation between past and future performance implying that investors would not have the upper hand of picking past winning unit trusts. 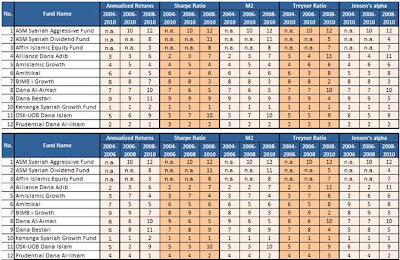 Having said that, there were a few funds which consistently appeared in the higher rankings and outperformed their peers and benchmark indices. The funds were Kenanga Growth, Kenanga Syariah Growth and AmDynamic Bond which were also winners of The Edge-Lipper Fund Awards for multiple years. In this case, investors would need to go the extra mile to identify consistent winners like the ones mentioned above rather than just buying any unit trusts recommended by your unit trust agents. David, wow what detail analysis. You deserve a PHD man! 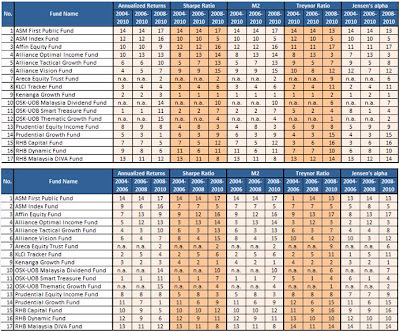 I must confess havent done as detail an analysis like you but UT serves me well, 25-30% average annual returns last few years even with 2008! Like everything else there are many investors (punters? )but only a small % make money. 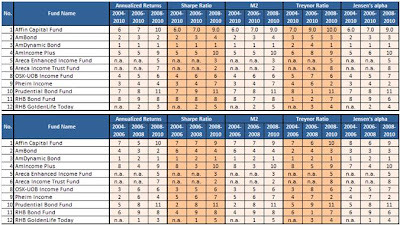 Agree most UT investors get very average return but it doesnt have to! - unit trust funds managers, who are they? - unit trust fund management expenses? - unit trust fund investment strategy? - unit trust fund size? Well agreed on the fact Kenanga related funds does perform consistently. There are currently other funds such as funds from Amanah Mutual Berhad that does the same.